David Ignatius is worried about Chris Dodd’s proposal to reduce the Fed’s regulatory authority over the banking system. Fine. It’s an arguable proposition. After all, the British have a separate agency to regulate banks and it didn’t seem to do them any good last year. So maybe it won’t help us either. The political challenge to the central bank’s authority comes at an especially delicate moment — as the economy begins to rebound and the Fed considers future tightening of monetary policy. It will need public support to combat inflation. But as the New York Times noted in a front-page article last week, the Fed is “under more intense attack than at any time in decades,” from both left and right. Wall Street so far appears unfazed by the criticism of the Fed, perhaps because investors assume that the protests are just political posturing. But this could change. “If Congress even appears to be politicizing the Fed’s monetary policy function, rest assured that two market developments are inevitable — a collapsing dollar and higher long-term interest rates,” warns David Smick, a Washington financial consultant. 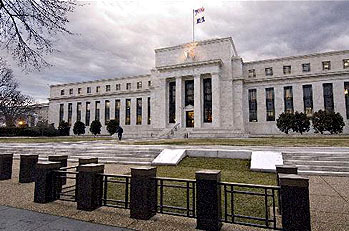 Interest rates are set by the Fed’s Federal Open Market Committee, which has 12 members. Five of the FOMC’s twelve members come from the ranks of the presidents of the Federal Reserve regional banks. These presidents are appointed by the boards of directors of the regional banks, subject to approval of the Fed Board of Governors. Dodd’s bill would give the Fed Board of Governors the power to appoint the entire membership of the boards of the regional banks. In what way does this politicize monetary policy? What it does is reduce the power of commercial banks and increase the power of the Fed. The only way to spin this as politicization is to point out that the Fed Board of Governors is approved by the Senate, which means that under Dodd’s plan the regional board presidents would be appointed by people who are appointed by people who are in turn approved by the Senate. This is pretty tenuous stuff. If you want to argue that private commercial banks should retain the power to elect two-thirds of the boards that appoint five-twelfths of the FOMC, go ahead. But they’re losing that power to the Fed itself. That only increases politicization of monetary policy if you think that the current Fed Board of Governors is too politicized in the first place. But that’s a tough argument to make: all modern central banks have boards that are appointed by political authorities. That’s democracy for you. Their independence is guaranteed by staggered terms, guaranteed tenure, and statutory authority, just like the Fed. Dodd’s stated intention is to keep the Fed focused primarily on monetary policy and leave bank regulation to a separate super-agency. As near as I can tell, that’s exactly what he’s done. Commercial banks might not like losing some of their influence in the process, but it’s the Fed that’s gaining at their expense, not Congress.